I am loving the farm house look so much right now. As a matter of fact we remodeled our kitchen last month, redid our front porch recently & we are almost finished with our dining room. We just have to build our DIY farm house table & hang our light in there. After we finish the dining room our next project with be the living room & foyer. 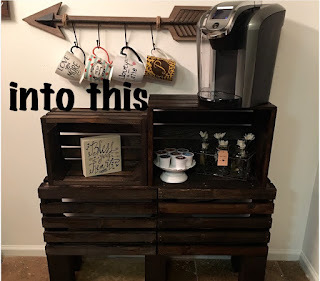 I will share those projects with you soon but until then I am going to tell you how we built our very own coffee bar for less than $50! 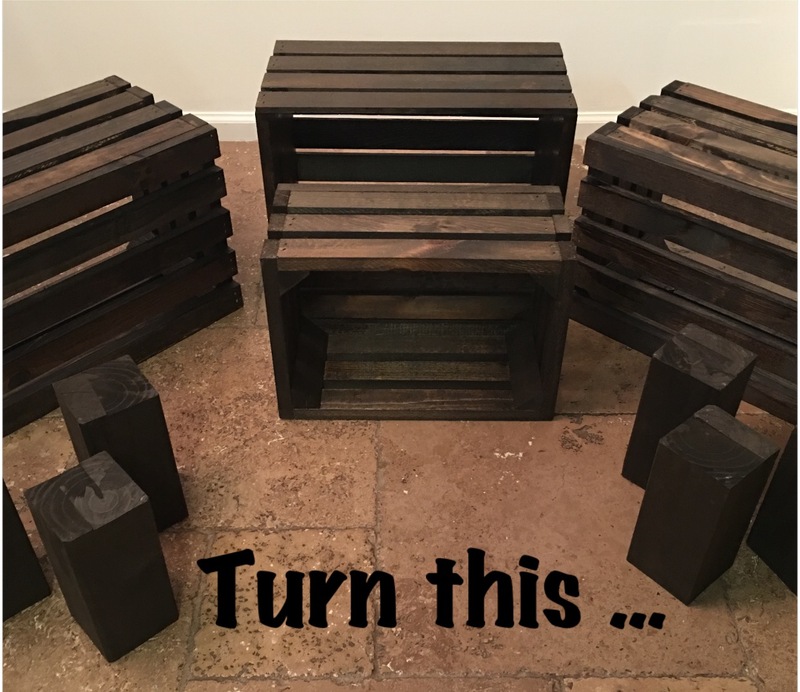 Stain your crates. I found it was so much easier to paint the stain on with a brush & then wipe it all down with an old rag. I wore gloves because the stain will get all over your hands if not & it is not easy to get off. The dark walnut turns out so great & I just love it. Let it dry. I did ours outside in the sun so it didn't take that long to dry. While your crates are drying, cut your 4x4 for the legs. You will need 6 legs & we cut each one 8 inches long. It's really up to you how tall you want yours. Once you've cut your pieces, stain them. You will have to stain one end because once you get it all put together you can see a little bit of the top through the crates. Once everything is dry it is time to put it all together. Take one of your large crates & match up the corners to two of the legs then screw them together. We put a few dots of wood glue on each leg for extra support. because your other bottom crate will also be sitting on these legs. Screw on the last two legs to the other large crate just like in step three. By doing this it makes it so much easier to screw on the middle two. Once you have attached the last two legs sit the crate on top of the middle two & screw those in. Take your third large crate, put a line of wood glue where it will be sitting & sit it on top of the base (the two large crates that you just put together). As you can see in the picture below, we did not match our ends together because with the small crate it just looked better being centered. Instead of taking the risk of the wooden crate cracking, my hubby nailed the top crate to the bottom one instead of screwing them in & it worked out perfectly. He put three nails in the front & three in the back. Repeat step six but with your small crate. Your very own coffee bar! You can then decorate it any way you'd like! We have gotten so many compliments on this little project that we created ourselves. If you have any questions feel free to comment below or email me at whitpegram@gmail.com.